Happy First Crocus Day 2017! Happy First Crocus Day! May your coming year be filled with beauty, hope, and renewal. You’ve probably never heard of this holiday before. That’s because I made it up. 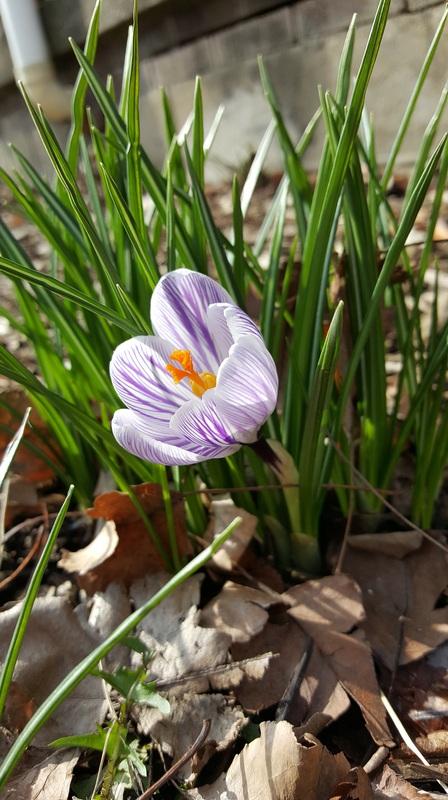 One year when the dark and cold of Winter had been weighing particularly hard on me, I saw an early crocus. In my part of the world, they’re the very first flowers to show themselves in Spring, often poking their grass-like striped green leaves up through the snow in late February or early March. For the first time, I really connected the appearance of the flower with the coming sunlight and warm weather that would lift my gloom. It filled me with hope and joy, and made the changing of the seasons feel relevant, to me, personally. So I chose to mark the occasion every year. Not the day we officially mark as the first day of Spring (although I celebrate that too). Not the day that crocuses appear for someone else. 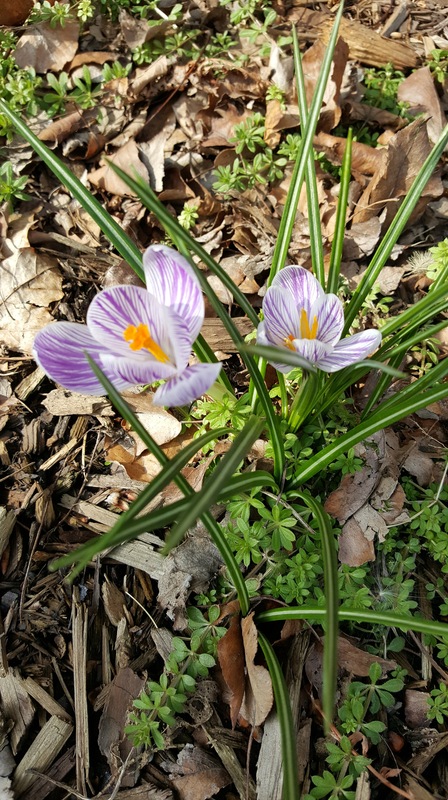 The first day that I, personally, see a crocus myself. Usually my celebration is very simple. I enjoy looking at the flowers, I take some pictures of them, and I share them with friends, along with well-wishes for the coming year. I usually spend a bit of time thinking about what hope means to me this year, and what I’m trying to bring about in my world. Then in general I just try to have a fun day, do things I enjoy, and carry a positive spirit into whatever I happen to be doing. Since it’s a spontaneous holiday, I don’t have anything planned for it, but now that I’ve been celebrating for years, I start to anticipate it and get excited when it’s nearly time. That’s it. Nothing crazy. Nothing formal. But it’s fun and it makes me happy. I like to think that this is how our Heathen holy days got their start. People connecting with nature, noticing when things happen, and associating different feelings and experiences with different times of the year. I think this probably happened pretty organically at first, and then over time became the traditional holiday associations we have and celebrate today, even if we don’t know where they came from and don’t share the same intimate connection with the natural world that our agrarian ancestors did. Crocuses have some important associations for Deitsch people too. They’re the flower that produces the spice saffron, which is expensive and precious due to how labor intensive the process is to gather it from the plant and make it ready for use. Deitsch farmers became known for their cultivation of saffron and their fields of crocuses. It was a way for families to make extra money as well as season their own meals. I’ve actually never tried saffron personally–might have to give that a shot this year! These kinds of personal observations, these one-on-one connections to the natural world and its cycles, are an important part of living an Urglaawe life. They arise organically when you are just living in that spiritual space and interacting with the world around you. 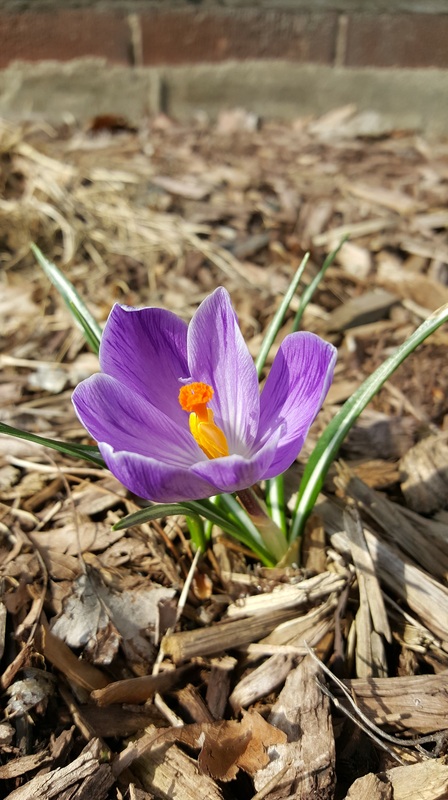 There’s no Deitsch ancestor from the 1700s that celebrated a day called “First Crocus Day”, but I bet there are plenty of ancestors who got excited at the early signs of spring, like shoots of green and returning birds. Urglaawers in other parts of the world might have very different natural patterns they notice with the changing seasons. In part, we take our traditions forward by creating new ones in the same spirit. What new traditions are you creating? How are you helping Urglaawe grow? I’d love to hear from you!